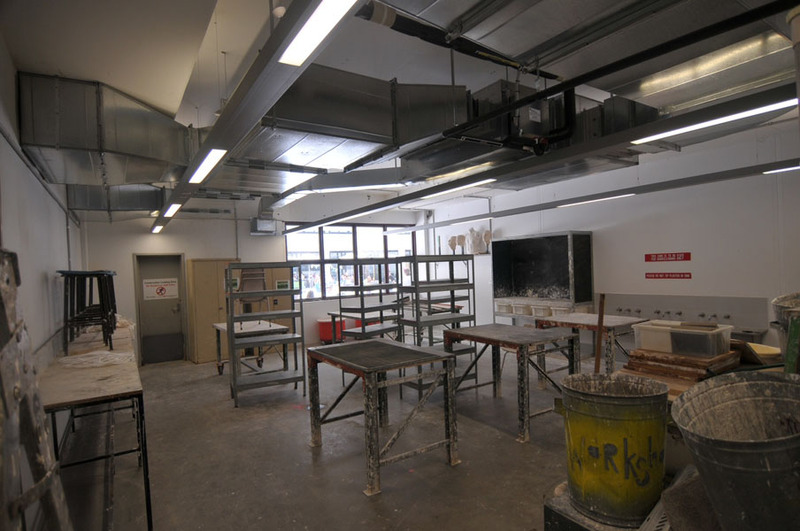 R&D Air Supply Pty Ltd is currently installing the Mechanical Services for the Major upgrade to the UNSW College of fine Arts campus at Paddington. This project involves the Design and Construction of Mechanical services to suit a new Teaching Facility Block D comprising 5 levels of teaching spaces utilizing air conditioning, natural and mechanically, ventilated spaces; refurbishment to the existing Block F comprising Design and Construction air conditioning to: Art galleries requiring strict Grade A Temperature and Humidity conditions, and to the remainder of Block F, air conditioning, natural and mechanically ventilated spaces. The Design philosophy needed to take into account achieving a 4.5 Star Rated (Design), Green Star building for the newly constructed Block D. This influenced decision making during the design process which led to adoption of the following: a partial campus wide shared energy system for the air conditioning utilizing central chilled and heating water plant, reticulating chilled and heating water throughout the campus; non potable water usage for the heat rejection cooling water; a campus wide Building Management system controlling campus wide building services; use of non ozone depleting refrigerants and utilising materials that use non ozone depleting substances during their manufacture, compliance with the Green building Council of Australia, energy modeling report requirements. The Central chilled water system comprises a water cooled magnetic bearing chiller located within the basement plant room of block D. The heat is rejected by reticulating condenser water to a low profile, low noise cooling tower, with inlet and outlet attenuators, located within a plant room on level 3. The cooling tower was specifically selected to meet the stringent noise level requirements issued by council, as the campus is located adjacent to a densely populated residential area. 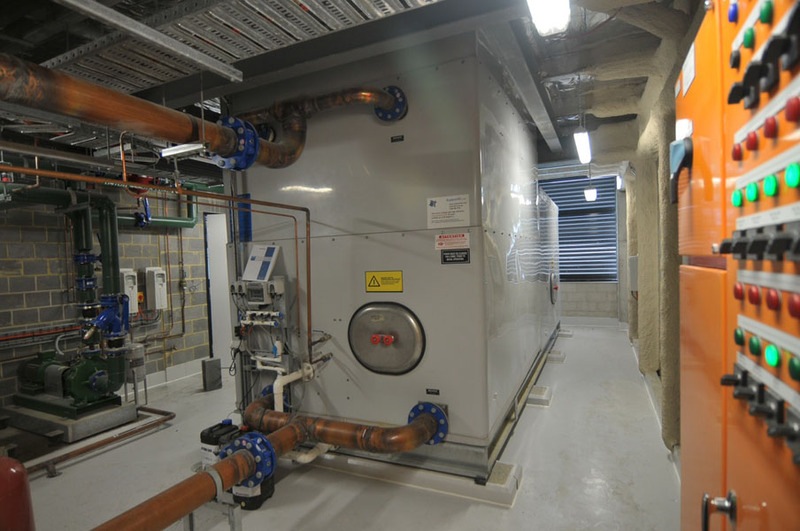 The central heating plant comprises a high efficiency gas fired boiler located within a dedicated plant room located on level 3 of Block D. Chilled water and heating water is reticulated by duty/standby pumps to numerous fan coil units located throughout block D which serve individual teaching spaces operating to their own time schedules and temperature set points. Chilled and heating water is also reticulated to Block F to serve the Art Gallery spaces and lobby entries to the art galleries. 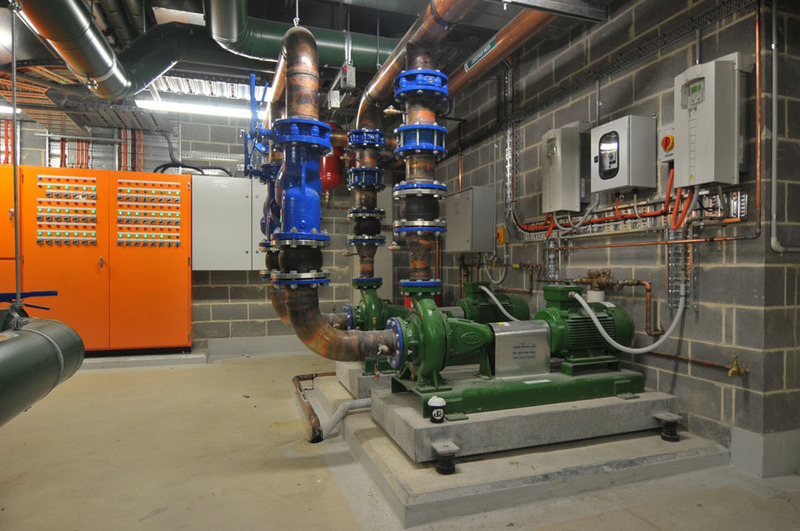 The chiller is capable of accepting variable chilled water flow which is utilised by VSD pump control at low load conditions during periods of non-occupancy or intermediate seasons. 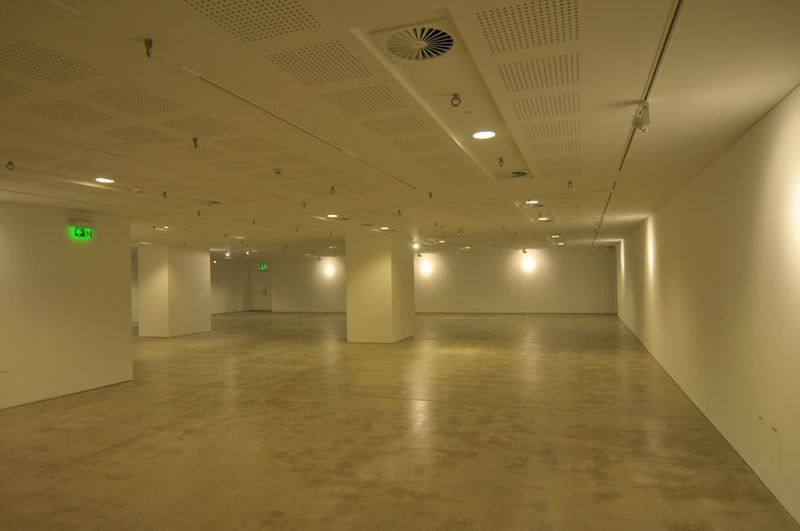 The Art Galleries associated with Block F have been provided with Dedicated Air Handling units. All art galleries have been provided with appropriately sized chilled water coils, heating water coils together with duct mounted humidifiers to maintain the stringent Grade A internal temperature and humidity conditions. A dedicated air handling plant room has been constructed in the basement of Block F which houses the air handling plant serving the gallery spaces of block F. In addition one air handler is located within the Block D basement that serves Gallery 1 which extends between block D & Block F. In addition to the art galleries, the lobby entrances to each art gallery have also been provided with dedicated air handlers and duct mounted humidifiers, capable of delivering humidity control which act as a "buffer" zone to the Art gallery that they enter onto. The remainder of block F has been provided with a mixture of assisted natural ventilation systems or air cooled air conditioning, to meet the client brief and budget. An additional floor was added to block F and natural ventilation utilising cross ventilation was specified by the client. Extensive design development and presentation of multiple options for air conditioning to the remainder of Block F were presented to the client including: connection to the central chilled and heating water system, VRV air conditioning systems, individual, air-cooled split systems and Hybrid ventilation systems. The project is very challenging. The design and for construction drawings have been peer reviewed by UNSW and an external Building services consultant. Our heat load calculations also have been peer reviewed and together with the equipment designed and selected for the project, inputted into an energy modeling program which demonstrates compliance with the Green Building Council of Australia requirements. This has been confirmed, completed and submitted, by others, to the GBCA. Working with the existing structure of block F has proved significantly challenging with the coordination of other trades. Ceiling installations are minimal and as a result all services need to run within a narrow central corridor to keep them hidden from view. A significant amount of man hours were put into services coordination during the design development phase of the project. The site is also a "live" site. Time was required to develop relationships with the Builder, Hindmarsh, and the College of Fine Arts. The campus is being utilised during construction. Significant staging of the works has had to take place to allow the campus to remain operational. Block D is due for completion before block F so that the new block D can be occupied, Block F vacated, so work can continue seamlessly for us, and the operation of the campus.